It is often said that individuals are not disabled because of their specific conditions, but because of the inherent ‘ableism’ of the society that has failed to create an inclusive infrastructure to support their needs for smooth functioning in public spaces. A society which revolves around matching the needs of able-bodied people routinely prevents the disabled from accessing the social space in a comfortable and dignified manner. Thus, the experience of disability in a public space is in fact derived from the social experience that is based on biased policies and provisions. It further implies that the disabled population goes through, what may be described as, an ‘imposed invisibility’ as they are constantly denied infrastructural accessibility, deterring them from becoming a part of, and contributing to, the mainstream. The right to sanitation entitles everyone to sanitation services that provide privacy, ensure dignity, and are safe and hygienic. However, in almost every public space, including schools, prisons, banks, markets, and restaurants, it is found that discrimination based on caste, gender, disability, age, or other status makes it harder for some people to access adequate sanitation services than others. No where is this discrimination more evident than in the access to public bathrooms for the disabled. The data provided by the World Health Organization claims that almost 15% of the world’s population is disabled in some way or the other. Keeping in mind that women are the most vulnerable to the lack of access to toilets in India, it is not difficult to imagine how much worse it must be for disabled women to find and use toilets that allow them comfort, safety and dignity. 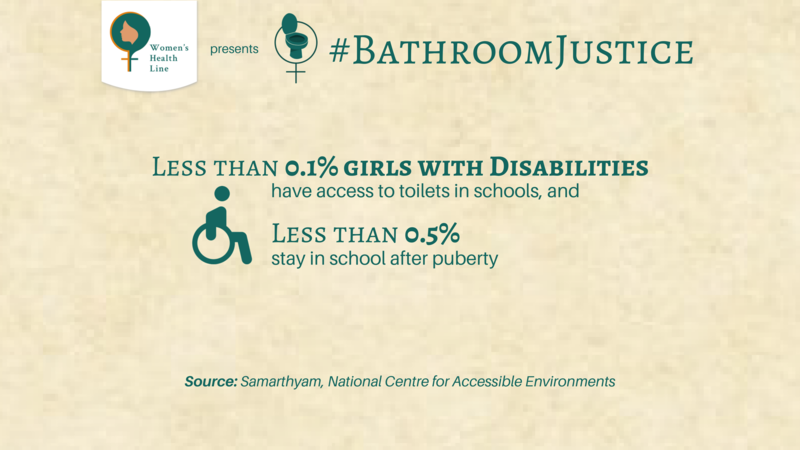 According to the estimates by Samarthyam, an NGO that works for universal accessibility and inclusivity, only 0.1% of girls with disabilities get access to toilets in their school and consequently, less than 0.5% continue to stay in schools after hitting puberty. Where households lack a toilet or access to public bathrooms, disabled women and girls are taken to defecate in the open by their family in the wee hours of the morning or late at night. When there is no one available to assist them, they are kept waiting for long hours and suffer from grave health consequences. Open defecation is already a public health and sanitation issue in India. With regard to women, it also jeopardizes their safety and dignity, and women who are blind or speech impaired, or orthopedically disabled, are at greater risk of abuse from outsiders as well as their caretakers. WHAT CONSTITUTES AN “ACCESSIBLE” TOILET? In order to understand the implications of the word ‘equal access’ with regard to disabilities, let us first look into what constitutes a disabled-friendly or accessible toilet. An accessible toilet should help in enabling the disabled to gain quick access to facilities that make it easier for them to use a bathroom. These facilities might differ from regular toilets in terms of the space available, lighting, flooring, and doing away with the disabling barriers that may be present in regular toilets. It is equally important to provide as much ‘independent access’ as possible, to ensure that the individual can use the toilet without help, or with minimum help, without compromising the individual’s sense of dignity and self-respect. Some of the features of an accessible toilet include Western-style commode with running water supply. These toilets should be spacious to allow for a wheelchair to manoeuvre, as well as to accommodate caretakers to provide assistance to the disabled person. The height of the commode and washbasins should be low, or adjustable, to the height of the wheelchair. There should be grab bars installed on either sides and in front of the urinal, so that people can hold on to these in order to raise themselves up, and for support. Taps should be provided at an appropriate height so that they are within the reach of the wheelchair user. Proper ventilation and lights should be provided inside the toilets and along the pathway leading to it. For disabled children in schools, trained staff should be available at all times in order to assist them in using toilets. The research conducted by Samarthyam highlights that none of the urban cities fare satisfactorily when it came to availability of accessible toilets in public spaces. It is evident that policies and initiative for people with disabilities to access toilets have been neglected. In the capital itself, barring the airports, malls, some cinemas, and metro stations, the accessible toilet cannot be located easily in any of the public spaces, such as bus stops, markets, and even schools. Even Sulabh toilets that are mercifully ubiquitous in the city lack accessible toilets. In order to make sure that the new buildings that are being constructed carry accessible toilets, the Ministry of Urban Development has introduced a compulsory clause in the building bylaws. According to this clause, the accessible toilets should also be used as a family toilet, equally accessible to the elderly, pregnant women, individuals with medical conditions, and children who need assistance while using the bathroom. This is to make sure that such toilets are used frequently, so that they are not converted into store rooms or locked away. Another plausible way to overcome this challenge would be to link the accessibility and safety for disabled with the plan of creating 100 ‘smart’ cities by the Ministry of Urban Development. Naturally, cities that have inadequate infrastructure and amenities for all its citizens can hardly be called ‘smart’ or sustainable, as they are missing out on participation of a large number of disabled and elderly population. Therefore, urban planning projects from the very beginning should consider incorporating the needs of the disabled to create a barrier-free environment. Most sanitation initiatives go a long way if they are clubbed with an equally robust information and awareness programme that brings about behavioural change in people. In the absence of accessible toilets, disabled people who are forced to use general toilets should not be made to feel humiliated and given all kinds of assistance and comfort that empathy and kindness can allow. It has often been brought to notice that able-bodied people take over the amenities meant for the disabled, and thus in the case of an emergency the disabled person is kept waiting for long and suffers. Hence, it is important to sensitise and educate people regarding the needs of the disabled, only then can we begin to envision a social infrastructure that does not pose barriers before individuals with mobility needs that differ from the larger section of the society.